This is like a piece of knitted jewellery. 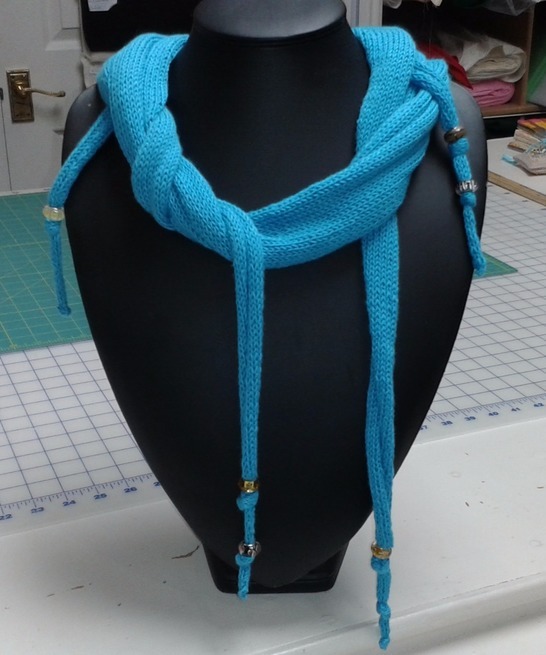 The ends can be laid through the long loop for a lovely, intertwined, draped effect. Do not choose beads which are too heavy, or they will drag the ends down; they may also hit you in the face if you move suddenly! You can wear the scarf long and loose, or fasten with a decorative brooch - it is a very versatile accessory indeed! Your beads can be matched or mismatched, as you choose. This scarf makes a lovely gift, and it is an easy pattern to work. You could sew on charms, trinkets, shells or found objects, instead of threading on beads, for a retro boho look. Simply knot the i cord, or bind it with shiny embroidery thread for a different look. Make the whole thing longer. Or shorter. Add tassels. Or even bells! This scarf is just waiting for you to customise it as you choose! Materials: one 100 gram ball of King Cole Bamboo Cotton 4 ply; 1 pair of 3.25mm needles; four lovely beads with largish holes in them (Pandora type beads are good, or try decorative pewter 'tube' beads); spare needle or stitch holder.